The Sony Ericsson XPERIA X10 mini pro gallery automatically locates the images, no matter where they are stored. There is none of the cool new look of Android 2.1 Eclair – you just get a plain grid with your images sorted by date. The gallery supports finger scrolling or panning so you can skip images without having to return to the default view. Just sweep to the left or right when looking at a photo fullscreen, and the previous/next image will appear. Pinch-zooming isn’t available but Sony Ericsson have come up with their own version of one-finger zoom that actually works great. You just hold your finger down and than sweep upwards for zooming in or downwards for zooming out. There’s also the double-tap zoom if that’s how you roll. Unfortunately, there are no Bluetooth file transfers in the gallery or any other fancy functionality that more demanding users might expect. The X10 mini pro is a simple tool for previewing your images and it won’t do more than that. The video player is simple in looks and functionality. You get a list of all videos available on the phone and play/pause, skip controls, as well as a draggable progress bar. MP4 files are as good as it gets. The petite Android cannot play DivX/XviD videos but even if you get a DivX player from the Market, it’s hardly worth the effort on the 2.55” screen. Despite a fresh redesign, the music player on the XPERIA X10 mini pro didn’t get much in terms of new features. It manages your audio files decently but there is very little extra functionality beyond that. The best bit is the Infinite key that allows you to quickly look up a song or album on YouTube or Sony Ericsson’s own Play Now arena. There isn’t even gradual typing for searching a specific song even with the QWERTY, so you will have to use the kinetic scrolling or opt for artist sorting. At least there are three smart playlists that automatically gather your Newly added, Most played and Never played tracks. There are still a lot of shortcomings of the music player that need addressing, though. For example there are still no equalizer presets, nor any alternative skins. The Sony Ericsson XPERIA X10 mini pro is also equipped with an FM radio, which has a really neat and simple interface. It automatically scans the area for the available stations and places “notches” on the frequency dial for easier scrolling to the next station. Or you can mark some of them as favorite for easier scrolling. The Sony Ericsson XPERIA X10 mini pro performed pretty close but surprisingly not quite identical to its QWERTY-less sibling in our traditional audio quality test. It's either that Sony Ericsson had to use different hardware for some reason or they've tweaked the software. Fortunately, the results are even better than the ones we saw from the the X10 mini with improved frequency response and intermodulation distortion. The noise level, dynamic range and stereo crosstalk have remained impressive too. The total harmonic distortion levels are pretty good and the volume levels are about average. 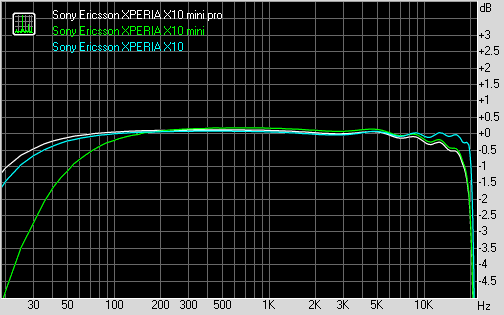 In fact the X10 mini pro and the X10 mini are both louder in the headphones than the full-size XPERIA X10.